SAN DIEGO (CelebrityAccess MediaWire) — The fiercely competitive San Diego concert market has become slightly less ferocious, as the 2007 season slated for Humphrey’s Concerts by the Bay has been booked by cross-town rival Viejas Entertainment. 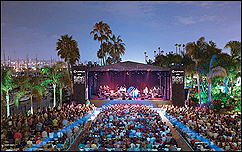 Viejas is well known in the area for its competing Viejas Concerts in the Park series in Alpine and Viejas Concerts at Bayside series at downtown San Diego’s Embarcadero Marina Park South. Over the past seven years, Viejas Entertainment has engaged Humphrey’s in several high-stakes bidding wars over popular artists. The new partnership was launched last fall, following the retirement of producer and talent buyer Kenny Weissberg, who had guided Humphrey’s for most of its 25 years. House of Blues, Live Nation and Nederlander all made bids to replace Weissberg last fall, but Bartell chose Viejas despite their tumultuous past. He believes this year could set an attendance record for the 1,400-seat outdoor venue, with slated acts ranging from Humphrey’s perennials like B.B. King and George Benson, to newcomers like Musiq Soulchild, comedian Paul Rodriguez, k.d. lang, Ani DiFranco and Queen Latifah. Viejas president Steve Redfearn and veteran talent buyer John Wojas both regard booking Humphrey’s as a major opportunity to bolster Viejas Entertainment. The company also books the ipayOne Center, the Del Mar Racetrack, Soma, ‘Canes and other area venues. “I think the biggest fear Humphrey’s had – and mind as a talent buyer – was that we’d put all the good shows at Viejas and the mediocre ones at Humphrey’s,” Wojas told the Union-Tribune.